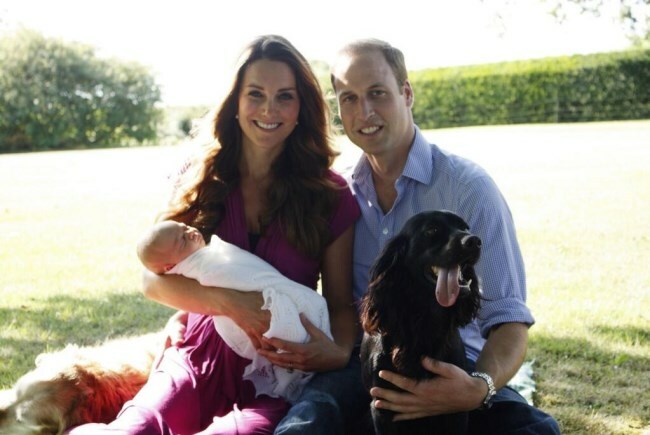 Last week we heard the joyous news the Duke and Duchess of Cambridge are expecting their second child. Many have estimated the baby will be due around April - more than estimated in fact. British odds-makers began making predictions about names and birth dates for William and Kate's second child. When Kate hits the twelve-week mark the Palace will confirm the month. Until then, how much will we see of Kate during this pregnancy? At the moment the Duchess is with her parents in Bucklebury. William joined the Queen and Prince Philip at Balmoral last Thursday, went shooting on Saturday and was spotted at a church service yesterday. The imminent decision on Kate's mind is her much anticipated first solo trip to Malta, scheduled for this weekend. This was marked as an important milestone for the Duchess in her role as a member of the Royal family and it was seen as a special gesture by Her Majesty to send Kate to the country she spent some of the happiest times of her early marriage in. The Palace confirmed Kate will make her decision by Wednesday, and while I believe she would like to go I think it very unlikely at this point. Even if she feels somewhat better by Wednesday, there are absolutely no guarantees she will not be very unwell by Saturday. Meanwhile, Palace staff have been busy searching for a replacement to fill in for Kate. William is thought to be the frontrunner for a variety of reasons. As Kate's husband it would seem fitting, press and media have booked their accommodation and are expecting to have a senior member of the family there. However, if Kate is feeling very poorly she may well want William by her side leaving the role open to other royals, including Prince Harry. One imagines Princess Beatrice would be very eager to attend (she's incredibly willing to become more involved in royal duties) but she may be considered too junior a royal for such a visit. As you can see, this is following a very similar pattern to Kate's first pregnancy, although it's important to note each pregnancy is different and a nurse I was speaking to informed me Hyperemesis gravidarum can be considerably worse with successive pregnancies. Kensington Palace said engagements will be taken on "a case-by-case basis" meaning we may not see anything scheduled for some time and if we do they may be announced with very little notice. Just a couple of weeks after her first pregnancy was announced Kate made a surprise appearance at the BBC Sports Personality of the Year Awards. The press were informed of the news Kate was feeling well that day and wanted to present an award just hours before the show. The Duchess wore a stunning green Alexander McQueen gown but looked quite tired and pale; she elected to stay for only 45 minutes. 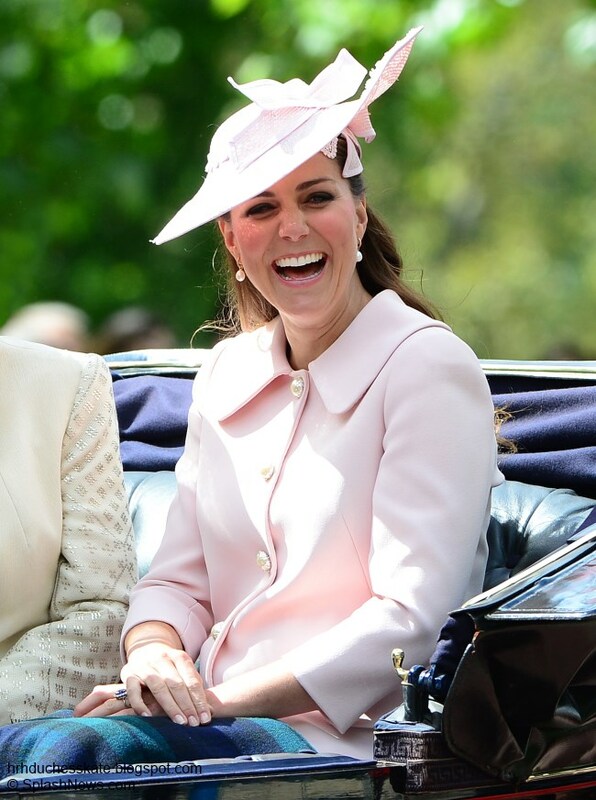 A couple of months later Kate was feeling considerably better and began taking on a few engagements here and there and rounded up her official appearances with Trooping the Colour, before taking maternity leave five weeks before George's arrival. Annual events attended by the Royal family, such as Remembrance Sunday in November, are ones I would pencil in for Kate's diary. Where the Cambridges will spend Christmas this year has been another topic of conversation. Last year they enjoyed the festivities with the Royal family at Sandringham, and the previous year at Bucklebury with the Middletons. It is believed this is a pattern they mean to continue, ensuring neither family is left out. If the couple do plan to alternate family Christmases, this year they will celebrate with the Middletons. It would offer a more relaxed family setting than Sandringham which involves meeting well-wishers, the walk to Church, awaiting the press and several outfit changes. In terms of fashion, the thrifty Duchess will almost certainly repeat her maternity wardrobe for official and private events. Which pieces from Kate's wardrobe would you like to see her wear again? Immediately the beautiful bespoke blue Emilia Wickstead dress Kate wore to an Art Room reception springs to mind. It was very Jackie O, just perfect and very stylish maternity wear. The Tara Jarmon coat and matching bespoke dress would be lovely for Kate as she approaches the later stages of her pregnancy. Kate's much-loved Topshop polka-dot maternity dress. The Duchess selected Séraphine as her go-to maternity wear brand and ordered a number of dresses and other pieces from the label to wear throughout her pregnancy and in the weeks afterwards Séraphine founder Cecile Reinaud discussed her delight upon discovering Kate was a fan: "The Kate effect is huge and we have been enjoying a 400% growth in sales since it became public that Kate bought Séraphine dresses back in April 2013". Below we see HRH in the £46 fuchsia Jolene Dress for the first official portrait of Prince George taken by Michael Middleton. Of course, the eyes of the world's media will be focused on the Lindo Wing once again as we await the first glimpse of the little prince or princess who will be introduced as his parents leave the hospital for the second time. After the birth of the baby, it is believed the couple plan to spend the first weeks at their country home, Anmer Hall. Popular names being guessed for the little one already include Alexander, James, Louis, Arthur for a boy, and Alexandra, Victoria, Catherine, Elizabeth and Charlotte ;) for a girl. Do you have any name predictions? I expect the couple will stick with tradition but may surprise us by incorporating more Middleton family names this time round. It's a very exciting time for the couple and indeed for royalists around the world. 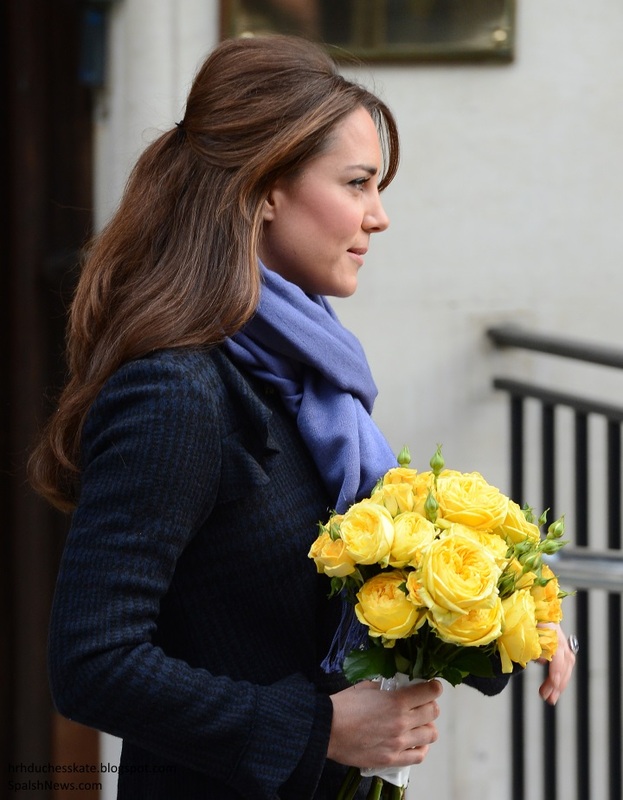 We'll keep you updated as news comes in and in the meantime we hope Kate feels better soon! Personally, I'd love to see Princess Beatrice take on the Malta trip if Catherine can't make it. The York girls have been somewhat out of the limelight after the royal wedding and it'd be great to see Beatrice take on such a high profile engagement! I'm happy to see support for Beatrice. I didn't think much of her until I saw video of her in interviews and at events. She is extraordinarily polite, composed, and sincere -- and down-to-earth. These are the same qualities people see in Kate -- so I was taken aback by a comment in the last post that said Beatrice doesn't have "what it takes" to go to Malta. Why? I suspect the poster wrote that because Beatrice isn't tall and slim -- but I hope that's not the case. Beatrice certainly looks tall and slim to me! She just doesn't have as much amplitude on the world stage--or recognition as the wife and mother of future monarchs. Of course, only William or Harry--or the Queen herself, of course!--can come close to "measuring up" to Kate's star power. (Of course, their clothes won't be nearly as interesting as hers!) But I hope one of them can go. I really don't want Kate to chance the trip. MM, I share your feeling IF someone did make the statement about Beatrice based on height or weight. But I honestly don't see it happening. Charles has been trying to streamline the monarchy for some time now, and there appears to be a good deal of tension between him and Andrew. Imagine the resentment and feeling of "oh, so now we're good enough" from the York camp. Coverage of the tour would be eclipsed by speculation about family politics and this is something they need to avoid. You know, I think there is one thing in Beatrice's looks that makes her unfit for such a solemn duty - and that is that she looks sooo young. Yay! More Beatrice fans! I think the daughter of Prince Andrew is certainly an excellent candidate to take on more royal duties! I've seen interviews with her and she's smart, polite, funny, down-to-earth and very well spoken! It's been sad to see sniping and hateful remarks about her by some of the same folks who get furious if even a word of critical comment is written about Kate. Beatrice has star power too. I've seen more and more photos of her at various events and the media seems quite taken with her. I would expect that Andrew might have private thoughts about Charles's turn of mind if the girls were allowed to take on a more royal and public role but he'd likely be happy they were being given more royal duties, thus more royal income and better police protection. I have read that part of Charles's feud with Andrew, privately, in part relates to Charles's dislike that Sarah Ferguson lives with Andrew at Royal Lodge, Windsor. Beatrice might be a bit junior for an engagement like Malta - frankly, I thought it would have been wonderful if the queen and Prince Philip returned there - but hopefully we'll see more of this pretty and accomplished young princess in the future!! I'm so excited for them! For a boy, I predict Arthur, and for a girl, I originally thought Charlotte but am now thinking Caroline - honors both Kate's mom and Prince Charles. I really hope she feels better soon...HG truly sounds awful. They might, but I think Elizabeth or Victoria are more likely. I like both names but I'm rooting for Elizabeth! Personally I like Arthur for a boy. I don't think they'd choose Alexander or Louis since those are George's middle names. Yay someone else from The D! I'm keeping my fingers crossed for an Arthur or Eleanor! As much as I like Alexander, I doubt they'd use it since it is one of George's middles. I'd like to see Caroline as a first or middle name. Caroline is a royal name, is the feminine version of Charles, and a version of Kate's mom's name. But I do like Eleanor. Maybe they can spell it different, Elinor? Always thought it interesting Jane Austen used both spelling of Eleanor/Elinor in her stories. But suspect Kate and William would stay with the traditional spelling. Read in the Junor book on royal children that the queen and Philip thought Edward would be a girl and didn't have a name prepared. (Which seems odd.) That could be why they used Edward again. It does seem an odd choice since the the Duke of Windsor was the most prominent holder at the time. But Edward's full name reflexs some of his godparents - and the Duchess of Kent was his godmother. Her husband is Edward so perhaps that was part of the motivation. OMG, Leominster! What an astute observation! I never even realized that before and I am a HUGE royal history and Windsor history nerd! Not to mention that the Queen Mother AND Queen Elizabeth II blamed the Duke of Windsor for the death of George VI, believing that the stress of the kingship aged him and helped lead to his premature death. King George VI had only been dead 12 years when Edward was born so it is, indeed, a HUGE surprise that Elizabeth would name her youngest son after this hated uncle!! Prince Andrew's name, Andrew Albert Christian Edward, is odd in that he bears three of the names of the Prince Edward, Duke of Clarence, who was Queen Mary's first fiance, but who died young, Albert Victor Christian Edward. Andrew's names appear to be ancestral, in which case Edward is for Edward VII. But David Linley and Prince Henry both have David, the Duke of Windsor's family name, as part of theirs, so perhaps there was a thought of the Duke of Windsor. His nieces were very fond of him before the abdication. Not so astute - the book in question is by Ingrid Seward!! Think I must have been "oddly" distracted when I wrote that comment. But that doesn't change the oddness of Edward's name. The best I can come up with is the name is that of his godmother's husband, Edward, the Duke of Kent. Edward's other names are for his godparents; Antony Armstrong-Jones, Richard Duke of Gloucester and Louis of Hesse and by Rhine - on Philips side (not Mountbatten, as I had supposed.) The only godparent not to have some connection with Edward's name was a sister of Prince Philip. Haven't delved too deeply into this so if anyone has any other knowledge why Edward is Edward, I'd be interested. Certainly not for the Duke of Windsor although the duke was alive at the time of Edward's birth. The queen and Philip clearly liked the name since they used it as one of Andrew's as well. It does seem strange that a name so associated with someone the queen didn't like found so much favour. Leo, Elizabeth, Jean and Anon. - Didn't Edward VIII mostly go by the name David at least within the family? So maybe the name Edward didn't have quite the same connotation to them - just another name. Since his full name has 7 names (Edward Albert Christian George Andrew Patrick David) his parents used up a lot of available traditional "royal" names :-). Just a thought. Yes, Edward VIII was called David, the last of his names. Thanks for the list; Prince Andrew has four of his names, too. In this case, George, Andrew, Patrick, and David were for the patron saints of the UK, and as Prince of Wales he was David. His first four names are ancestral, for King Edward VII, Prince Albert, King Christian, and King George V (an overlap of ancestral and saints' names). Queen Victoria directed that her male descendants bear her husband's name. Frederick in George VI's name and Christian in Edward VIII's are the traditional names of the kings of Denmark, ancestral to Queen Alexandra. Putting Christian before the saints' names is effective, too. The naming patterns are interesting. I have found in doing genealogical research that given names can often answer questions. Using David in the royal family is no doubt such an answer, especially by Princess Margaret. Thanks, Leo. As you said below, I too like names. It's interesting that Queen Victoria and her son Edward VII each had only two given names. But Prince Albert had five, and Charles was one of them. There it is. Edward VIII, by the way, was born during Victoria's lifetime. If it's true that the monarch approves the names of heirs, she approved his. From what I've read, I think Uncle David was the "Funcle" of his day! So sad in so many ways that his relationship with his nieces was broken off. Good Morning! I am hoping for a girl! Having two, I would love to see the duchess have fun with little girl stuff- I love all the glitter and sparkly girly fun that little girls bring. I hope they go with a traditional name like Victoria but since the little one is unlikely to ascend the throne, they could bring in a "new" name like Lauren or Samantha and have traditional middle names. Since they seem to be doing things "their" way, I hope they do. I disagree on using Spencer for a girl but Diana as a middle would be lovely. If they go traditional, I hope for Alexandra. I agree. Diana for a middle name. NOT as a first name. I have seen many people think she should be named Diana, but no way. Firstly, I can't see them doing it. Secondly, what a burden for the child! I hope and pray she feels better soon. I was so sorry to hear she was feeling rough again. Maybe she will feel like celebrating with Prince Harry in a few weeks. Hope that he has a Happy Birthday today, too! I remember so vividly when he was born! As to her clothes, the Duchess is always lovely. Lovely post, dear Charlotte, as always... I was horrified to learn from you that HG can get worse with every pregnancy. On dear !!!! I really feel for all the mothers who suffer from it. So sad when a pregnancy should be a happy time. I sincerely hope the Duchess will feel better soon. I'm so thrilled for William and Kate and for both families! I can't wait to hear more news and see Kate's maternity choices! I am hoping for a little Princess and do love the names Charlotte, Elizabeth, and Catherine! But a brother for Prince George would be lovely and I do like the names James and Alexander! Thanks for the post This and the Royal Digest are my favorite distraction from the day! I hope she is feeling well enough to go to Malta.....it will be disappointing for everybody including herself ( I'd imagine) if she isn't well enough to make the trip. I don't remember ever seeing anything she wore during her pregnancy with George that I didn't like. Some of the coat dresses in the late spring were gorgeous......I think I need a photo recap. A photo recap is an excellent idea! Maybe NOT "KATE LOVES Being Pregnant." (She'd be crazy to love the condition considering how sick she gets!) --Maybe Charlotte could name it "WE LOVE Kate Pregnant (When She's Feeling Good!)" I thought that too last time, Lynn. That Kate didn't love being pregnant but she liked the result! I suspect William was sending a subtle view on the vote - a bit of support to those who would vote No. The queen can't be political but she came as close to stating her views on separation as possible but it must all be done in an oblique way. And William does love his hunting. So to kill two birds with one stone, pun intended. Kate may be perfectly happy being in the care of her mum when she's poorly. She and William have always had time apart. I think she is quite accustomed. As Catherine seems to be hoping to feel better by the end of the week and William commented that she would probably feel better in a couple of weeks, I can't help wondering if she is further along than we thought. She seemed to be better by 12 weeks last time. Unfortunately it doesn't always work in the same way in different pregnancies, but we can only hope (and pray) that she will soon be better. However, even if she does feel better, she will probably be advised to take things carefully. Personally, much as I enjoy seeing her and commenting on her clothes, I would rather know she was safe and well at home and able to enjoy her home life than taking any risks. She (hopefully) as many years to do the royal round. Jean, I agree with you. A healthy pregnancy is the most important thing. I believe William's comment about her hoping to feel better by the end of the week was polite diplomacy. Pure and simple. They don't want to be seen as making a decision prematurely and imply (in some people's opinions) that she doesn't want to go and is quick to get out of it. But I would be shocked if she does travel to Malta. Right now, I think she'd be thrilled to feel well enough to prepare for a single engagement, and get through it. And I do agree that a healthy pregnancy is the first priority. Absolutely. Most likely, William is in Scotland for reasons other than shooting, or he wouldn't leave Kate's side at this time. I have a feeling he is talking to HM about Malta. My gut tells me that it's William or Harry who will go in her place. Sending anyone else, would only serve to detract from the visit. I was thinking he was in Scotland because of the referendum this week - it's a really big deal in the UK - my theory was the Royal Family were demonstrating a show if strength by all being up there and attending church together. I completely agree with you royalfan: it makes the most sense for HM to send either William or Harry to Malta. I will be very, very surprised if Catherine goes, even if she does feel better. Everyone was very careful about short engagements for her at the beginning of her first pregnancy; it would be prudent to do the same again. However, I would also not be too surprised to find out she is ten or even eleven weeks along already. But I'm very flexible about hoping to be wrong--my little romantic heart would love to see the new baby arrive on Her Majesty's actual birthday, April 21! Royalfan He was there on a hunting trip. So that is why I think it is wrong for him to leave Kates side to go off hunting. I think William is in Scotland with the family because of the referendum. Kate's not well enough to be there so she's with her mother. I also think William would definitely leave Kate's side when she is not well - he is not a nurse. He'll make sure she is cared for - but I would not expect him to be cleaning up the throw up and holding wet cloths on her head. He'll carry on with his schedule and get on with his helicopter training and whatever sporting he gets up to. Kate's not well, but she ain't exactly dying either. Very true, Simone. Great point. Yes, there was far more to this than a hunting trip. Pauline, William has obligations, whether people choose to recognize that or not. Kate has the best medical care, she is with her family, and as I stated in another post, I believe the original plan was for them to travel together to Scotland. He can't be "at her side" 24/7 from now until the baby is born. William and Kate are reasonable, mature and they are secure in their relationship. This is the reason it has worked for so many years. Didn't Kate become ill at around six weeks with her first pregnancy? If that was true this time, she is somewhere around eight weeks pregnant now. Thank you, royalfan; I feel bolstered in my wish for April 21. We will know in a few hours who is going to Malta; I still think it will be either William or Harry and am leaning toward William, but I'll be pleased either way. I just noticed on the history of this blog that Kate and William and George went to Balmoral exactly a year ago, so perhaps Her Majesty had them down for this week and William was expected to fulfill the obligation at least in part whether Kate could come or not? I urge people not to spread the idea that William is mistreating his wife. It is unfair to both of them, and very hurtful too. I don't see what the problem is about the trip to Malta. I think she should go. Modern royal women are such delicate flowers these days. The Queen herself undertook a 5 month tour of Canada when she was 5 months pregnant with princess Anne. Queen Victoria herself ran an empire while constantly pregnant. Our own Zara Phillips gets back on the horseriding circuit and qualified for the Rio Olympic team. The duchess will feel much better if she'll undertakes the Malta trip. The public will definitely support her. You got to be kidding me? If it was a normal pregnancy, yes. But since she has a pregnancy illness that weakens her body and have her glued hugging the porcelain throne with an IV in her arm I think even you would see the trouble of making 10 engagments, a total of 9 hours on plane etc in a foreign country. I think the Sam poster is an Internet troll. Please don't feed the troll. Oh Dear Sam I think you better read up on this illness (as I call it) Kate is suffering before you say she should go. I don't mean any disrepect to you for your comment but you have no clue how bad this llness is and you show no concern for the well being of Kate nor her unborn child. Haha, I know what a internet troll is.. But they are usually anonomous or "new posters"/uses different names. Sam has shown up long ago and has started again now if my mind doesn't fail me. I think I agree with mm, too. This latest post was just too egregious and provocative to be "real." You overplayed your hand this time, Sam! MM, you nailed it. Thank you. I was never too impressed with the hello girls bit myself. :) And I can almost hear the laughter as this person (male or female) reads the comments. The best response is silence. People like this crave attention. We've seen a lot of that in recent days. Oh no "girls" here we go again!!! I definitely agree with you about him being a troll, I have me suspicions that Sam and the anon poster on the last thread that said that having a male doctor was better than a female one because they're "too emotional" might be the same person. Lol girls I'm deffo not a troll. I just have a blokes opinion. Don't mind me. It ain't easy being a fella. Blair 3:03, maybe, maybe not.......:) We had quite a few attempts at derailing the camaraderie and civility of this blog. Someone referred to a high school clique, well, this was more like a toddler tantrum. The queen did take a substantial tour of Canada when she was pregnant with Andrew. It was not five months and she was not five months pregnant but it was an extremely grueling tour where she visited every provence. It proved to be a controversial tour, in part for that reason -- it was considered much too demanding for early stages of pregnancy. The announcement of the pregnancy wasn't made until she returned. Apparently the queen did feel ill during much of the tour but carried on. William and Kate see things so differently, it's hard to know how the queen honestly feels about their decisions. She has generally let her family function as they wish. But if Kate is truly suffering from H.G., (there was some bemusement last time because of her quick recovery in time to go to Mustique but she was clearly very ill in early December) I don't see how she could manage in Malta. One possibility would be to send William with her to cover if necessary but then there doesn't seem much point in exhausting her by sending her at all. Many royal ladies have carried on with quite full schedules while pregnant, including Princess Anne. Mette-Marit was hugely pregnant when she came to Britain on a royal tour. Marie of Denmark went to Asia while pregnant, and others may have travelled as well. Rania of Jordan, who I once hoped Kate would emulate with her strong role, was breast-feeding on one tour and took her baby with her. But Kate wasn't doing much before she was pregnant and given she has been ill, don't know that we can expect much from her now. A full term pregnancy is 10 months! 40 weeks/ 4 weeks in every month = 10 months. Royalfan hahaha what a funny way of describing it. I find it quite funny when someone randomly posts on here and the post is obviously meant to stir the proverbial stew, it's easy to spot these posts. My sweet Anon 17.39 - unsure what school you attended but as there is only 1 month that actually has 28 days - February, unless it is a leap year when there are 29, you will note that every other month has 30 or 31 days. Therefore, universally it is accepted that a month contains 4.348 weeks and typically rounded to 4.4 weeks per month. Yes, In the Medical field a pregnancy is 40 weeks. We also consider it as 10 Lunar months, which is fairly equal to 9 Calender months. We also divide a pregnancy into 3 trimesters - which can become confusing when trying to fit the 40 weeks into a calendar month. I haven't ever found Sam's comments to be troll-ish and had the impression from responses to his previous posts that his comments were appreciated. In this case, I think he's just someone who hasn't had (obviously) or known someone who suffered from morning sickness thinking it's a mind over matter thing. Those of us who have experienced it know that's not true. Also, I don't mind when, say, little old men call me girl or kid. In my experience it has been cute as opposed to condescending. I'm not saying Sam is any age in particular, I think he is trying to relate to what is a mostly female audience. You all definitely have a right to your opinion, I just wanted to let Sam know that I enjoy his posts and think he is funny! Hi Charlotte! I have enjoyed your blog for a very long time. You obviously put in a lot of hard work and I certainly appreciate it. It's a very refreshing read. Last week I finally told all my friends and family the real experience of what I went through with HG. I posted it to the Duchess Kate Facebook page. (It was too long to post here.) I hope it will give some insight on what Kate may be going through, though each person and each HG pregnancy is different. Thanks again for all your hard work! I read your story on the Facebook site and my heart goes out to you. What a terrible experience. I hope that, as many people have said on the blog in the last few days, Kate can find a way to support the HG cause as it's so unknown and misunderstood. Your story was a real insight and thank you for sharing..... Sorry I couldn't reply on Facebook but I don't subscribe. I wonder if they'll be going on a "babymoon" (not sure if this is strictly an American concept)? Didn't they have one last time - I recall seeing pictures of the Duchess pregnant on a beach in a bikini. I also recall them attending a wedding at a ski resort. I'm also curious to know if they'll be going on holiday with her family in January? I'm still hoping for a Malta trip as I think it's an excellent opportunity to prove herself. In then end, though, they are adults who decided to try for a baby when they did, knowing her past history with HG and they decided against waiting until after her engagement (provided this was a planned pregnancy). They decided this would be best for their family - the Queen, and everyone else, will need to respect this decision. Also, if the Daily Mail is to be believed (again big IF - I know they're not the most reliable) the Duchess is looking to hire a maternity nurse. So perhaps she's not planning on a long Maternity leave, and will take up engagements shortly after birth? As for names, I'm thinking something British and traditional. I can't imagine them going for Harper or something similar! I don't know how far down the succession line a rule about naming for previous monarchs would apply. It has been a long time since there was a Queen Margaret, and never, I think, a King Andrew or a Queen Zara or a King Peter. Both Princess Margaret and Prince Andrew were second in line when they were born and until there were children in the next generation. Peter Philips was fifth in line when he was born as the Queen's oldest grandchild. Princess Margaret was probably named for a relative of the Queen Mother, Prince Philip's father was Prince Andrew of Greece, and Mark Philips's father was named Peter. So naming children for grandparents and other relatives is allowed. Prince Philip's aunt was Queen Louise of Sweden, and of course there have been Kings named James and Edward and a Queen named Anne. One of Queen Victoria's daughters was named Beatrice; I think the Duchess of York said Eugenie was inspired by the French empress. If there is a rule about using the names of previous monarchs, it must apply only to the direct heirs; their siblings are often named for ancestors or relatives, or in Zara's case for none of the above. But the queenly name Charlotte would be available for a girl! In the past, there was a great tradition of royals using family names - it was mandated that Victoria's children name their children Victoria or Albert. The queen was named for her mum, it is said that they wanted to call HER Margaret but George V didn't like it so they waited and gave it to their second daughter. Don't know that it was a family name. Think maybe because the queen mum was Scottish. The queen also used some family names, Andrew is from Philip's side. Anne was another name George V didn't like, I believe. Not sure who Edward was for if anyone, surely not the Duke of Windsor. There was some suggestion Alexander came from the Spencer side, all three names are the names of William's Spencer cousins, but it is also so popular and William doesn't seem too close to his cousins on his mother's side. I think William and Kate chose what they like and will again within reason. Just for accuracy's sake: Princess Margaret was fourth in line when she was born. Her grandfather was still King then. Her uncle was first in line, her father second and (then) Princess Elizabeth third. Also, Princesses Beatrice and Eugenie were named after Queen Victoria's youngest daughter Princess Beatrice and said daughter's daughter Princess Victoria Eugenie who went on to become Queen of Spain. That's not to say that every member of the Royal family is named after a certain ancestor, however the names that are given are usually ones that have been used before. Zara is the one exception I can think of but one should perhaps keep in mind that she also doesn't hold any Royal titles. Once we get past the prince and princess titles, we sometimes get interesting names. Savannah is quite an unusual choice - although very popular in the States and possibly in Canada where her mum is from. Isla is rather popular right now but not at all royal. Lady Helen's children have some unusual names, there's a Columbus as I recall. But closer to the throne, the names do tend to stay traditional. You're right of course, C - I forgot that King George V was alive when Princess Margaret was born in 1930, and Edward VIII had not yet come to the throne. From 1937 to 1948, Margaret was second in line. The Queen has a Bowes Lyon cousin named Margaret Rhodes. I think she and Princess Margaret may have been named for an older relative (an aunt?) I remember reading about in the Queen Mother's biography. But supposedly her parents wanted Princess Margaret's name to be Anne, which was vetoed by her grandparents. It was said that Prince George Alexander Louis was named after King George VI (Albert Frederick Arthur George), Prince Charles (Charles Philip Arthur George), Queen Elizabeth II (Elizabeth Alexandra Mary, named for her mother, great grandmother, and grandmother), and Prince William (William Arthur Philip Louis). I have never known whether Charles was for someone in the family. Prince Charles chose Louis in William's name for Earl Mountbatten, and William for Prince William of Gloucester. Prince Edward (Edward Anthony Richard Louis) could have been named for the Duke of Windsor or the Duke of Kent; his second name is for Earl Snowdon, and he shares his third name with the Duke of Gloucester. Viscount Linley (David Albert Charles) apparently was named David after the Duke of Windsor's family name. Charles is an Armstrong-Jones as well as a Windsor name, but non-royal names are few and far between among children close to the throne. Leo, the only US Savannah I know of is a newscaster named Savannah Guthrie. I don't believe I have ever known a Savannah personally. But there are a lot of exotic names among the youngest generation, so perhaps there are a few toddler Savannahs. And possibly the rare southern woman named for the city. I had never encountered the name Isla before, although there are women named Ayla. Just took a brief look. Savannah is 58th in Alabama but 40th in Connecticut, 55th in California for example but these states have vastly different populations so many more Savannahs in California. So don't know that Savannah is purely a Southern name. Isla doesn't seem to reach the top 100.
http://www.babycentre.co.uk/popular-baby-names has the same for Britain and I like it best. It seems in 2013, Isla was number 8!! No Savannah in top 100 that I see, but Georgia is on the list. Should Scotland do a bunk, wonder if Isla will stay as popular? I do think sometimes Britain leads the trends. All the Jennifers I knew in Britain were older than those I knew from the US (although hardly a stastical sample.) And I see Emma is quite popular in the US lists while it is seen as a bit passe in England and has dropped to 29 in popularity. Can't say I know any Savannahs or Islas myself but maybe I will soon. I think of Alexandra as quite popular but notice while it is still in the top 100 but quite far down. Charlotte which is a popular choice here for a royal girl is higher and Eleanor is on the list although not too high. Olivia, Emily and Sophia are high, as they are in the States as well. (At least the few states I looked at.) The first two are traditionallly royal and the only queen Sophia I recall was the wife of George I, a most unfortunate lady who I don't think ever left Germany. But wasn't the Electress of Hanover a Sophia? George was 13 in 2013. Wonder if it won't have jumped up now. According to Wikipedia Savannah was the 30th most popular name for baby girls born in the United States in 2007. It was also among the top hundred names for girls in Canada and Australia in 2006. What I wrote should read Olivia and Emily are not traditionally royal. I think Anmer Hall will be ready by Christmas so its possible the Middletons will celebrate Christmas there. That makes it possible for Will, Kate and George to spend the holidays with both sides. Lovely post Charlotte! Thank you for the treat since we are all dying for more news and discussion of the Duchess! Every time I have thrown up this past week with my pregnancy nausea I have thought of Kate and prayed that her sickness gets better soon! Question--Do you think it's possible that using "Alexander" and "Louis" for George's middle names rule out the use of those names for another boy, or Alexandra and Louisa for a girl? I can't imagine they would be that repetitive even though the names are lovely. Hope you feel better soon Anna! Anna, I don't think they would repeat names........or use a "modern" one as some celebrities tend to do. As mentioned above, names can be repeated. Louise seems unlikely since it's already in use but don't know that I would rule out Alexandra, although it is a heavily overused name at the moment. Despite Savannah, though, I doubt that we will see a Georgia to go with her. 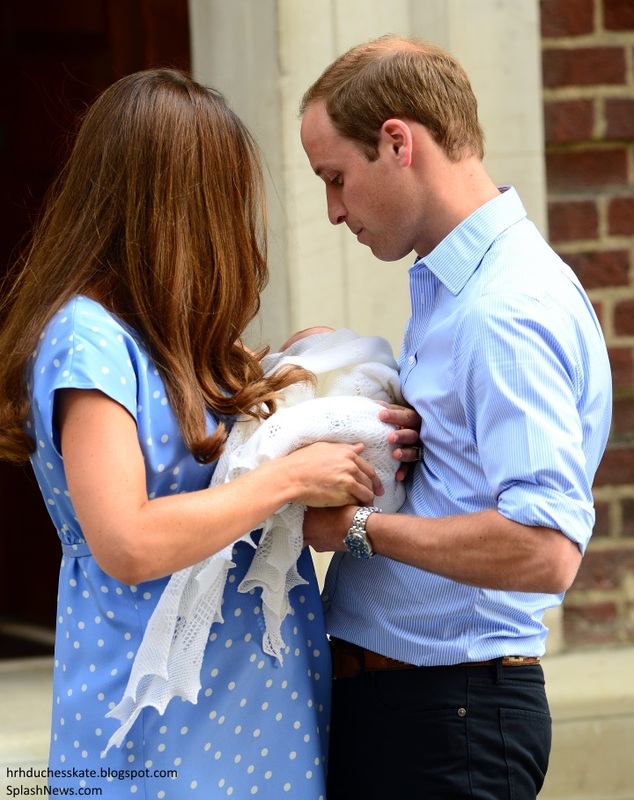 My favorite outfit was not a maternity garment, as Kate was in the early stages, and she has worn it since. It was the white coat she wore with brown accessories for a wedding in Switzerland. She wore it again early one Christmas morning at Sandringham. I hope as the weather cools, Kate will wear that coat again and let us see the collar. The blue cocktail dress in the picture above is my favorite of her actual maternity outfits. I liked it that Kate did not usually wear the sort of very loose clothing we wore when I was pregnant, and yet her outfits were not skin tight like too much maternity wear now. Looking at the lovely photo from New Zealand in the previous thread (black dress with silver fern), I have noticed the visible veins in Kate's hands and feet. I hope she is being advised to protect her leg veins during this second pregnancy, since that's when varicose veins tend to appear. My bets for names are Victoria, with Diana as a middle name, for a girl, and Arthur for a boy. My understanding is they don't name children after reigning monarchs, so Elizabeth is out, but this child will be the spare regardless of gender, and the BRF does prefer the names of prior monarchs for those in direct line for the throne, so I think that leaves Victoria. Or Mary, but Victoria is more likely IMO. As for Arthur, I think it will either have to be that or Richard because I think all other regal names are in use. Good guesses! Richard has got a rather negative connotation because of Richard III though, so I doubt they'll go with that. I doubt they'd go with Richard as well, although Richard III is undergoing an image change since his remains were discovered. I really enjoy Plantagenet and Tudor history so I'd upvote Richard if that name were on the short list. I like Richard too and Richard III is almost redeemed, although still not clear what happened to the princes in the tower. Elizabeth and Victoria are both lovely names and the most likely, I think. But then again one never knows. I definitely think they'll go with a name that's been used in the Royal family before. So besides Elizabeth, Victoria, Catherine, Alexandra and Charlotte a girl might be named Alice, Mary, Margaret, Adelaide or Caroline as suggested above. For a boy I'm thinking Arthur or Thomas. Perhaps even Albert. I like Philip, too--at least as one of the names of another little prince. I really like Charlotte for a little princess! Isn't that Pippa's middle name, too? I love all of your name suggestions. It turns out William has been in Balmoral since Thursday and Kate has been in Bucklebury with her parents since then.The post has been updated to reflect this. With thanks to Simone for alerting us to this! I love the name Margaret, wasn't William really fond of his aunt?? When I was pregnant w my daughter, Elizabeth and Margaret were on the top of the list. Elizabeth won bc thats what my daughter looked like, and not a Margaret. Margaret Diana Carol OF Cambridge has a nice ring to it?! I feel like I'm stirring the pot here, and don't mean to cause unpleasant comments--but I was wondering. Do we know why William is in Balmoral? Going shooting seem an odd thing to be high on the list of priorities--though I suppose he could be out in a way to celebrate with the other men/women in the family. Though I would have expected an expectant father to stay with his ill wife! Of course, it is possible that he is really uncomfortable seeing Kate so ill, or perhaps Kate would rather be left alone when so ill. It just seemed odd to me. Other than that, thanks for this post! :) So much fun speculating on baby names. I was also wondering if you would consider doing a post of her maternity fashion again, now that she has a new baby bump to dress! It could well have something to do with the independence referendum this week, Kate. Kate, I suspect the original plan was for them to travel together, but Kate wasn't able to make the trip. And, most likely, they would have discussed the trip to Malta with the Queen. Now, there are other decisions to be made as well. I don't see anything terrible about William going for a few days and Kate staying with her parents. I honestly don't. Kate I agree with you. William should be home with Kate. He was there last time with her. But I think he wanted to go hunting so he pushed her oiff on her parents so she would not be at KP by herself. That way he would not feel so bad about going. He should be ther for George too. He said he is a hands on daddy, well hands on means that when your wife is sick you take over taking care of your child/children. I do not think Kate wants to be left alone. And I don't think the women are othe rfamily memebers. I just hope it is not Jecca Craig on the hunting trip. Oh well William will be William. Charlotte I would really love your insight on William leaving his sick Kate and goes off hunting for 4 or 5 days. Hands on daddy/mommy means that when your wife/husband is sick you stay home and take care of your child/children. Ya they have a nanny plus her parents but that is not the same. I am disappointed in William. There's no need to be disappointed in William. Kate is a secure young woman and this couple has a working relationship based on maturity and a reasonable approach to their unique obligations. Anon 06:35 (Ali) . EXACTLY..... :))) Well said. In her first pregnancy, William was with her all the time, even in hospital and was criticized for not carrying out engagements, I suspect this time at least he understands what it is and quite candidly most women would prefer not to have an audience. Perhaps William has taken George with him. Most members of the family go to Balmoral at some time whilst the Queen is there, so am not surprised that he is there---probably family discussions. Whilst there they go deer stalking, which certainly doesn't always end in shooting---though there are grouse to be shot. No offense to Will (I like him) but his presence in Scotland would have 0 effect on the republican movement right now. He had been there for four days before we even found out he was there. Pippa recently had a birthday and I was wondering is she has an engagement that has not been announced. It could be a family celebration and the beginning of wedding planning.I also believe that William gets summoned to the queen periodically and he meets with her without Kate so this could be one of those events. What I don't get is when does he start his new job I thought it was mid-September. I'm sure William's visit has to do with the referendum. He was most likely planning to go anyway, but there must is much talk behind the scenes of how things will be handled, no matter how obliquely the royals may speak of independence in public. It has to be a most distressing time for the queen, and feelings are so high, that it will continue to be distressing no matter what the outcome of the vote. Frankly, this is a lot more important for the royals than his helicopter career. Kate is quite the mummy's girl and I'm sure she is being well cared for. I always preferred my mum when I was ill, and miss her now, even though hubby does a very caring job. Being nauseous especially may be something best handled with mum. I believe there was a quiet celebration of Pippa's birthday but imagine they will wait for any engagment announcment until Kate is better. Already, Harry apparently missed some of his birthday celebrations because of Kate's illness. Certain he didn't mind -- he seems a very sweet brother-in-law. The first pregnancy is where one does not know what to expect and it was most concerning at the very beginning of their very first so naturally William was by her side. They did end up spending or so it seemed more time with her family at that time. Perhaps William feels more at ease this second time around despite the illness although obviously Kate felt well enough for the drive to her Mum's and for William to be away. Just never know if the original plans were that Kate and William planned on going to Balmoral together. As has been said, Kate would be perfectly content to be with her Mum and their relationship so stable and secure that William can spend some time on his own going hunting and visiting with his father and grandparents. They had already spent a lot of time together during this off time. We know that they are no doubt in touch with each other by phone or text (probably both) every day. There is always the use of skype via the internet or phone if visual contact is desired. Modern technology sure makes a lot of things easier. If an emergency occurred there is always that trusty new helicopter. William anyway I think prefers to be with the more laid back style of his in-laws but there may have been a very valid reason for the trip to Balmoral and if there is a hunting trip involved just icing on the cake and we know William does enjoy his sports. I have also been wondering when William begins his training for his new job. I had thought this was the primary reason he could not be with Kate on the trip to Malta or was it? Now it appears he may go after all to Malta. Tomorrow we shall finally know who is going. I initially thought it was because of the referendum; however, he made no appearances at all. So maybe not. If you're going to go to make a statement, then you ought to be seen, right? Not just photos of him in cars. So I guess I'm leaning to tone deaf again. Is there any link, please?!!! The magazine is Point de Vue, should be available in London at some of the newsagents that carry foreign magazines. It is Issue Number 3451 and of course in French. But don't delay, it's a weekly. (Waterstone's might have it too.) Valerie Trierweiler is on the cover. The photos are charming. Don't know if the pictures are online. I haven't found them elsewhere and was quite surprised to find them in Point de Vue which is quite reputable -- at least I think it is. My bets are on a girl, named Caroline Elizabeth (plus another middle name I'm indecisive about right now). Betting fun aside, best wishes to Kate, and let's hope for the best. I'm also very very curious about the outcome of the Malta question. Me too Courtnee. He has been gone since Thursday. But we have to remember William does what he wants. I am sorry and I know I will check flack for this but I believe he should be home with her not in Scotland out playing. What would happen if for god for bid something happened and she needed to go to the hospital and he was in Scotland. And poor George having a sick mommy and his daddy gone for 4 to 5 days. Ya I know they have a nanny & her parents are there but that is not the same. I think William is just thinking of himself and wanting to go play with his friends. And even if Kate aske dhim to stay with her he would have gone anyway. Ditto, Ali. Family time...........and life goes on. They have obligations and Kate is a secure woman who gets that. Does it change your opinion if William was invited by his grandparents who are not long for this world? If it was Phillip who organized the shooting party and this get together was planned awhile ago? Would you cancel on your aging grandparents? Have you considered that he may be needed for family business meetings? I think It is unreasonable to expect William to stay by Kate's side during pregnancy sickness - this is an unpredictable condition that calls for a nurse, not a trained helicopter pilot. She is not in critical condition. It may affect Kate's schedule, but it shouldn't affect Williams. Yes indeed royalfan: I do not see (nor would I want mine to be there) why a husband has to be present while his wife is violently ill and unable to enjoy his company, not to mention looking like a horrid mess. A little too much reality for my elder generation. William gets a bit of time with his family - trip probably planned for Kate to be there too, originally, as I don't think they'd been up to Balmoral yet. Kate is very close to her mother and gets that loving presence while she feels so dreadful. My impression of the dynamic of their marriage is that Kate calls the shots. If she wanted William to be around, he would be. I agree with you but wonder if the Queen asked him to go due to his popularity. Moxie and Greybird, I agree with you ladies...very much so. IMO, one of the main reasons Kate won William's heart was because she "gets him". She understands his obligations, frustrations, limitations, etc. She is secure in her own skin and isn't a needy drama queen. They have a partnership that works and as with any marriage, if it works for them, great! I honestly don't understand the need to question their devotion to each other. So... the Queen and Phillip are going strong when it comes to Will and Kate slacking on working for the firm.... but now the grandparents are aging and don't have much longer left so why on earth would William rather be with his violently ill wife and baby son (when they had ALL of August to do so)? I don't think expecting a husband to be present around his sick wife is being a "needy drama queen". It may work for them but I still think it's weird. Will has terrible timing with these hunting trips. Remember the trip to Spain the weekend before his conservation conference? I take the position that you don't cancel on your aged grandparents because your wife has pregnancy sickness. William is invited to Balmoral - he doesn't just drop in unannounced. Elizabeth also sets the expectations and schedule for royal workload. What value is the position of Queen - if you aren't the one telling others what to do? Elizabeth is not a push over. If you take the position that William (and Kate) is not doing enough for the firm - then you are really criticizing the boss - Elizabeth. I think the idea that William and Kate are this independent 30 something year old couple is way off base. More than likely William spent the month of August with Kate and George and he would probably rather she be with him at Balmoral - but she apparently needs some privacy (and no one knows where George is - why assume he is with his sick mother?). You can look at it anyway you want - I see it as Kate is not well enough to attend to the royal schedule, (which was Oxford, Invictus, Scotland (Balmoral), Malta...) and William does not need to sit idle while Kate works on managing food intake. There is nothing he can do for her in that regard. And I take the position that you don't announce you're taking care of your wife and then do everything but, Moxie. We don't know the Queen invited him. He's got a cottage on the estate; he doesn't have to stay in the main house. Same with Charles. It could have been a planned trip with Charles before they found out she was pregnant, and he elected to go and Kate went to Bucklebury. So I think throwing out the last legs grandparents argument may not hold water. bluhare, he said "I'm going to go and look after her now" - which I took to mean he was heading home. Not that he was going to be her nurse for the next seven months. When William was at the church with the Queen, I made the assumption he was invited to be there - it's not exactly his personal routine. William and Kate took George to Balmoral at the same time last year -- it's not out of the realm of possibility it is meant to be an annual event with the Grandparents - the are getting old, I am projecting my own sentimentality here - only foolish people make the mistake of not spending time with their elderly relatives. I think it was a planned family gathering to Balmoral ahead of the vote - I concede your scenario is equally sound. Exactly, Moxie. I share your sentimentality; however, I'm not sure it's the case here. The family trips tend to be in August, don't they? It could have also been a last gasp trip before his helicopter job/training began. I thought someone here said that started this past Monday. But it makes no difference to me; I don't wonder what they do on their downtime. I'd rather talk about their uptime. I have so many ideas for classic girls' names--my favorites being Charlotte, Victoria and Caroline.... It is so fun to see others' suggestions! Maybe if we all just keeping sending prayers and positive thoughts she will be in the small percent of women that this time isn't as bad. It does happen. I hope even if she is better she doesn't go to Malta but isn't stays home. I saw that pic with her nice hand veins too. All I kept thinking was I wanted to stick an IV in one. Lol nurse thinking gets the best of me every time. Hehe I hope it is a boy so George will have a good friend built right into his family. Just like William and Harry have each other. A princess would be pretty cool too. As for names I hope that they stick with traditional names that are spelled traditionally. I am not sure about Diana as a first name. Victoria is nice so is Mary. Just my two cents. I love your blog - everything I need to know in one place. You are respectful and kind too - which is important to me. With Prince Harry's success with the Invictus Games he might be a perfect person go to Malta. I love Harry. When he was here in America last year we went nuts for him! He's a gem. Thank you, Charlotte, for another informative and engaging post. I'm not sure about names for boys. I like James and Micheal, but not Arthur. For a girl, I have to go with Elizabeth, Victoria or Charlotte. I agree that Diana would be too much pressure on her for a first name, but perhaps it will be one of her middle names. I loved her maternity wear the first time around and hope we'll get to see some repeats this time around. While I am disappointed she most likely won't make it to Malta, I'm glad she is getting the rest and care she needs. A healthy baby and mother are most important as I'm sure the Palace would agree. I hope the Duchess is feeling better soon and able to travel to Malta. I hope they have a girl and I can't decide on a name choice just yet but I was disappointed that George only has 3 names and not the traditional 4. But whatever. I will enjoy seeing the maternity choices as long as Catherine brings back the purple Prabel Gurung. That's one of my all-time favorite Kate dresses ever! I am hoping she is feeling better. I have been wondering that if her health has improved a little if modifying the amount of appearances in Malta is an option. Maybe she could go and do the most important engagements and do the rest depending on how she is feeling at the moment. I had HG three different pregnancies and if I hydrated and had Zofran on board regularly I was able to do some things without being miserable and without endangering the pregnancy. I think Sophie is a proven asset to the Royal family and she's got experience, as well as presenting a very elegant image now, so she might be a good choice for a step-in for poor Catherine (poor girl! but it will be worth it!). However, Sophie might have some engagements already lined up herself, perhaps. Just a thought. Sophie is due to be back in time but is currently on a Royal Tour of Canada with Edward - although the lack of coverage in the UK is disgraceful - you'd think Kate is the only member of the Royal Family the way some of them go about it. Some talk now that Harry is going. It may be just that - talk, but it's said he has cancelled his weekend engagments. That is true for some but there are many others who don't really know what pr how much the royal family does and feel, with the exception of the queen, they don't earn those privileges. Occasionally, Charles' engagments make some of the papers but not too often. But if anything negative happens, the papers are right on it. I do think it would be nice if they mentioned at least tours and the like - few look at the court circular anymore, if it even still reflects what's happening. The trouble with naming the baby for someone, or even choosing name someone else has, is that it excludes others. I wonder if they will chose Diana as a middle name if they have a girl, since they didn't choose Charles for George. So I'll go for Arthur Charles Michael, the latter for the two granddads. Charlotte or Caroline Elizabeth Diana. Hope they're reading and take heed! Perhaps they might use Frances---Diana's middle name and the male version Francis is, I think, Catherine's father's middle name. Yes that is true, although Diana didn't have an easy relationship with her mum and not sure how close the boys were to their grandmother. It would be a lovely double honouring though. Caroline Elizabeth Frances would be so clever - I quite like that. I wondered about John as part of a boy's name to honour the late Lord Spencer. Believe Diana was devoted to her dad. I just read this exact comment from the same poster on another website. Including the spelling mistakes! If trolls learned a bit of logic, how much more powerful they would be. In answer to your second sentence, see Maryland Moxie's excellent comment a couple of threads above, posted at 14:51 on 17/9/14. I can't put it better than she did. @Sarah USA Why do people continue to bring up Kate's work. There has been much written regarding who calls the shots and she is not the one. It is the Queen and Charles along with advisors. So if you have a problem with it then write to the Queen or Charles and voice your disappointment. This is a subject that has been beaten into the ground now for 3 yrs. or longer. I endured the dreaded HG and my husband traveled extensively while we were expecting. I was GLAD he had work! Glad he didn't feel obligated to do nothing while I was violently I'll for nine months. I just wanted to be left alone in my misery. Perhaps dear Kate feels the same? Will is on an unneccessary hunting trip, not working hard to keep his family financially stable. It is between that, and that she "might" be able to go to Malta when she has HG, an illness that makes decisions for you not the other way around (and she seemed to get the magic kind of HG that let her shirk her duties and go on holidays halfway across the world instead last time) that has people wondering if she really has HG after all. I believe she is pregnant and probably not feeling her best, but I'm starting to wonder if she actually has HG. The whole thing does not make much sense to me. Stephanie, I don't think people are wondering *if* she has HG. Most people can understand the diplomacy behind not being too quick to say she can't go. Out of respect for her hosts, they don't want it to look like she doesn't want to go, or that her condition may be worse than BP wants to admit. Haven't you ever timed a cancellation or change of plans so the timing is more appropriate? Stephanie, I have to agree with you. It doesn't make sense to me at all. First off, if she does have HG, why is she not in a hospital? HG is a pretty serious complication that can cause malnutrition, embolism, etc. She is carrying a royal baby - the royal family would not take chances if it was anything more than morning sickness. And, if she is very ill with HG, why is Prince William not at her side? The hunting trip is not an official engagement. In his circumstances, any decent husband would have stayed with her. Lastly, if it was HG the trip to Malta would have been called off immediately. Again, HG is a condition with serious consequences and no way would the RF take chances. And royalfan, I have to disagree with you. The RF are being incredibly rude by not giving the hosts, Malta, enough time to prepare for the visit this week-end. They're making it seem as if visiting Malta is such an unimportant visit that anyone from the royal family can fill in at the last minute. It's been a bad week for Malta with the boat sinking (I think this happened near the Malta coast). Leaving this decision to the last minute, especially since the trip was so hyped by the media, just makes the royal family seem flaky. She was hospitalised last time. And when she went on holiday, she had already appeared in good health at the National Portait Gallery engagement. So, nothing strange nor inappropriate. If Kate were not really quite ill, Prince Harry would not have canceled his birthday party. Sabby, past generations have given birth to royal babies behind palace walls so it isn't too surprising that she could be treated for HG at KP. It keeps thing simple for the patient...AND the hospital without all the security issues, etc. As far as the royals being rude. I disagree. The preparations have been in place for a long time. It's not like they're deciding whether ANYONE will go. And I stand behind my explanation for the delay in making that known. Stephanie and Sabby-00 - Are either of you a Midwife or an Obstetrician? If yes you might have reason to question Kate's diagnosis,but then I would be led to question your credentials because you are not demonstrating a knowledge base of this condition. HG can have very many degrees and has many treatment options. Last pregnancy I believe they were not anticipating HG and they were not prepared. She was in the hospital overnight (I think, but may have been a little longer) to be dehydrated and then discharged either to continue IV hydration at home or a medication regime that worked on an outpatient basis. This time I suspect they were prepared for HG and were able to get things set up at home and avoid the disaster from her last hospitalization. They may have already come up with a medication regime that is working and they are just making sure it is going to continue to work before committing to Malta. She may be able to function during the day and be on IV hydration to catch up during the night. A midwife/nurse/obstetrician may be accompanying her. Many possibilities!! So please do not suggest she does not have HG in order to further your attacking agenda on Kate. As far as your comments that "The RF are being incredibly rude by not giving the hosts, Malta, enough time to prepare for the visit this week-end. They're making it seem as if visiting Malta is such an unimportant visit that anyone from the royal family can fill in at the last minute" First of all they were planning on sending Kate and I am sure that is what Malta wants. It is not like they need to change the planned itinerary or other plans that have already been put in place. I am sure the Malta officials are in constant contact with the BP as to who they would feel a suitable substitute for Kate. I am a nurse, but that is besides the point. One needs only to do research and consider other experiences of HG to know its lack of boundaries and management. Please do not accuse me of attacking Kate. Given the prognosis of HG and that her foreign trip has not been cancelled does not make sense to me and I am free to say so. I will agree with you that Malta officials and BP are most likely in contact, I don't think Malta is being hung in the balance. AMEN Eve B I totally agree with everything you said. These people who comment here that think they know everything just pisses me off. 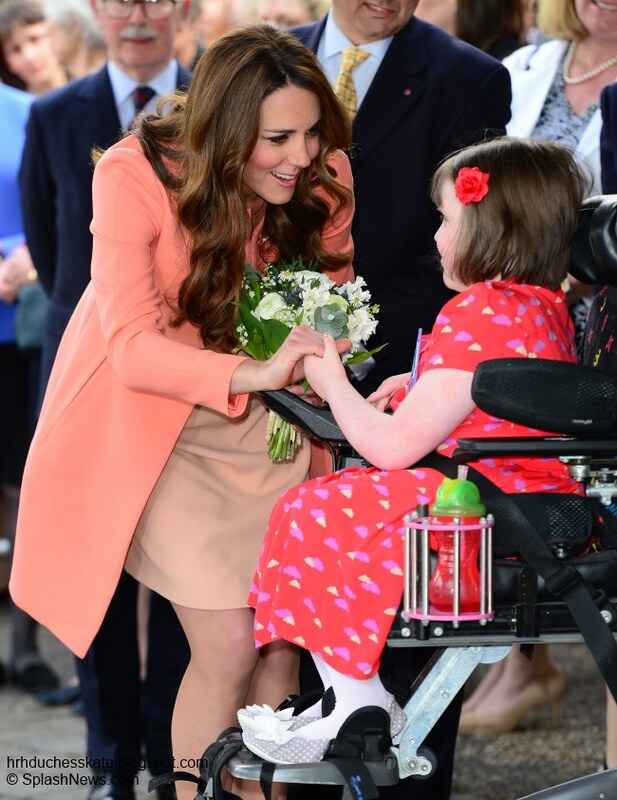 They do not walk in Kate's shoes nor have lived with this condition. But they come here and question her condition. The couple of friends I know who had H.G. didn't recover nearly so quickly as Kate did last time but of course Kate has been able to rest with virtually no responsibilites and she has the best possible medical care - a leval of attention few others have. So who knows. The line between H.G. and heavy morning sickness seems a little blurry but I know my friends had dehydration and substantial weight loss resulting from being ill so much. Pam, why do people who think they know everything piss you off? Possibly because you think you know everything? You don't. And neither do we. So we talk about it. That's what blogs are for. And it's amazing how alike you sound to someone else who posts here. Uncanny, even. If it's a girl, they may choose 'Elizabeth' or 'Eliza' perhaps? Oh clever Jean, Frances would suit perfectly. I fear things have not changed so very much in the RF that any child will be named Diana - regardless of her parents' wishes. HM famously put her foot down about the Duke wearing the Mounted Officer Uniform of the Irish Guards (which they wore as pallbearers for HM Queen Elizabeth the Queen Mother) rather than the dress uniform William preferred and I do not think he would get his way in this rather more important decision either, were he to select Diana. I may of course be proven wrong.I so like Caroline Anne Louise. But of course we may have another boy, and as someone pointed out, I think a Stuart name had ought to be used as one given name, regardless of the result of the referendum. After all, HM will become Queen of Scotland, should it pass. What a wonderful post Charlotte! I think Harry or Wills should go in her place. I don't feel she should go as she could lose the baby and it's not worth the risk. I will pray for her to feel better glad she is with her loving parents now. As usual, I think you called it quite right, Charlotte. I don't think we'll be seeing Kate until sometime next year, except for, perhaps, the odd paparazzi photo. My guess is that the next real official event she will undertake will be the Chinese tour next fall. That kind of negates the need for any new bespoke wardrobe as I would imagine the maternity pieces she's got as well as pieces that can be used for maternity wear, even in a colder season, will be recycled for the few, if any, public appearances she'll make between now and next spring. She was pregnant throughout a winter with George, although less further along than she will be with this baby, so the old pieces will work as well. Most of the royal press are guessing a late April-early May birth so her lighter clothing will work, expecting that we see another pointless "maternity leave" announcement in early to mid-April. I've read a number of comments that suggest Harry will stand in for her on the Malta trip and that, really, makes the most sense, since many of the engagements are based around the military and Harry's grandfather was stationed there while he was in the military. The Christmas vacation is another matter. I think the Queen allowed the stay with the MIddletons since Kate was going through a first pregnancy, etc. This year, it's different. Prince George and Prince William will be almost certainly required to make some sort of appearance, as direct heirs. I would expect Kate's presence would also be requested at Sandringham at some point during the official festivities. Kate is a seasoned royal now and I would expect that the need to coddle her is waning, at least as far as private royal family functions go as well as the need to make special exceptions for her. The queen and Prince Philip aren't getting any younger so that plays into the expectation that the family all be together on holidays too, not to mention that Will and Kate now have Anmer Hall to live in so they'll be close by Sandringham. It's possible they may choose to host this Christmas at their new home so Kate's family can be nearby and they can still partake of the festivities at Sandringham. My other hope is that the Palace press office and Will and Kate's PR team gets its act together and quickly. There is every opportunity to turn this into a cause for the duchess that can draw attention to a real problem, that of extreme morning sickness, without the duchess having to lift a finger. There's also the chance that this lengthy absence and the pregnancy and sickness announcement, combined with the duchess's extreme weight loss prior to the pregnancy announcement, could spawn a lot of rumors and talk about not only her health in general but her state of mind and why she's being kept out of the public eye so much. Nobody's discounting or denying that she - and other women - suffer greatly with the extreme morning sickness. But if she stays out of the public eye for the entire nine months or is seen very little, there is a legitimate cause for concern about her general health and what the Palace isn't saying. People, like Charlotte and all of you, genuinely care about Kate and her health and what's going on with her. The Palace can address that in a manner that releases enough information to reassure the public without invading anyone's privacy. I hope they act on it and do that. Extreme weight loss?? Look at the picture at the top of this post, which was taken around the first of August. No extreme weight loss; Kate looks very healthy. I see no reason to think she is unhealthy in general. She undertook a demanding tour early in the year and chases a vigorous toddler while supervising major renovations! Also, she undertook various duties during her last pregnancy. There is no reason to think she won't again, once she recovers from HG. Surely the Chinese tour, if it's more than a rumor, will be delayed to 2016. Kate might be having a baby on Anzac Day rather than going to Turkey as supposedly was planned. Things have to be adjusted. But why the gloom and doom? Yeah, right - extreme weight loss?? I don't think you need to worry that the Duchess is anorexic. I saw her in person in Canberra earlier this year. She's one of those tall, impossibly slim and at the same time athletic people. The blue dress she wore to the Poppies installation at the Tower looks the same on her as on the previous occasions she's worn it. Thanks Charlotte for all the lovely posts - awesome news about the baby & I hope the HG passes quickly. I'm just catching up with the last month's posts here as work has been busy and my mum's in hospital. Can't quite believe all the drama! The Palace just confirmed there will be no decision regarding Malta until tomorrow. William and Kate will consult with doctors and make a final decision which will be announced in the morning. The delay suggests Kate is feeling somewhat better at the moment thankfully. Yes. At first I thought they just needed time to find and pin down the replacement, and that's why they were delaying the announcement. But now with her being okay enough to be transported to her mother. And then this little delay sounds more like her really hoping than a night more for the PR people to organize. I doubt that if she goes, she will go alone. I think William is going with or without her. I can't eally see her going on a boat tour of Malta ;P. So maybe if she goes she will just do some of the engagements with him and William will fill up the rest. That is what I have been thinking, too, Rebecca. Kate may be far enough along that the flight is not considered dangerous, and if William is there she would be able to adjust her activities as needed. A doctor always accompanies them; one was listed for the Belgian trip. In this case, it might be an OB/GYN. I wonder when William's training is supposed to start, but probably not on a weekend. I'm thinking that she is further along this time than last. That they got 1 week of sickness in before having to announce it this time. I did not know they always travel with a doctor, but ofc they will this time.. But we'll just have to wait and see. Some people say he has already started? But I don't know. There are alot of times we hear nothing about him. What is saying that that time is not spent training? This Malta decision is causing me trouble with understanding the difference between HG and bad morning sickness. If Kate is able to go Malta (similar to when she was able to go to Mustique) what does that say about managing HG vs bad morning sickness? Charlotte, I hope and pray Kate's suffering from HG will slowly diminish as time goes on as it seemed to with George. I remember watching videos of Kate from the BBC Sports Awards and she looked so unwell. I remember her hands shaking badly. I felt so sorry for her. Praying that she is feeling well and the baby is growing strong. If Kate goes I believe she will go alone. To short notice to put into place everything that needs to be done with extra security team and people. I do not think she should go. She is only risking your health but that of the baby. I was thinking the exact same thing - it makes perfect sense for the two to go together just in case and for William to "supplement" as needed. I loved all of Kate's maternity wear from last time. I thought she always looked healthy and had the mommy glow. One of my favorite's was the ice blue dress she wore at the National Portrait Gallery. She looked amazing! I haven't had a chance to read the comments about William's trip to Balmoral, but I'm sure some were not happy. My thought was Kate might have been a part of the plans and the trip, but due to being ill could not attend. I don't think one would just pop in to Granny's castle for a hunting trip with friends without a little bit of planning. 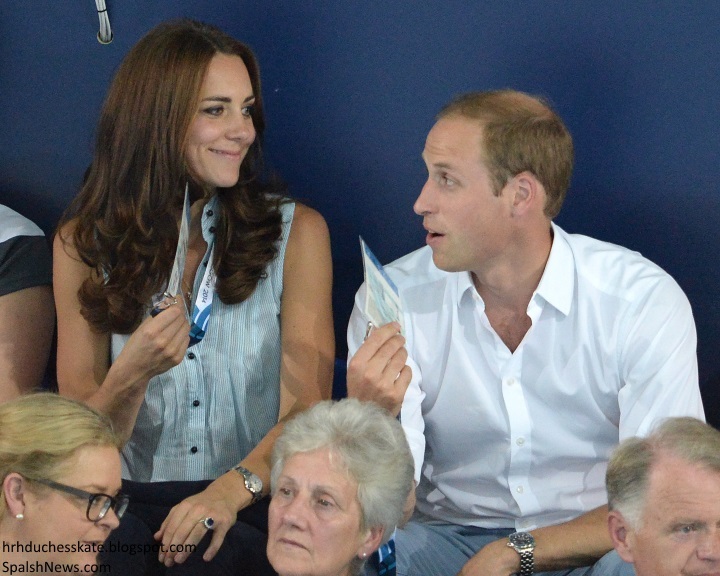 I'm sure William made sure Kate was comfortable and well taken care of before he jetted off. I hope they had a great time! What about the vote with Scotland....oh dear. A country divided. I hope and pray it is a "no" vote, but I guess we'll see. I'll check back for more news on Malta. Hope everyone is having a great Wednesday! Very eager to hear the news and hope Kate is able to go! I am on baby 3 and have never heard or been advised that air travel early in pregnancy is risky. I'm surprised do many have mentioned it. I think the best idea is for both William and Kate to go so she can rest as needed. Not everyone with a dissenting opinion is a troll.